As the holidays approach, many people decide to host a sit down dinner for family and friends. A “traditional” sit down dinner can be quite a bit of work, but with a little advance planning your dinner party can be made to look effortless on your part. 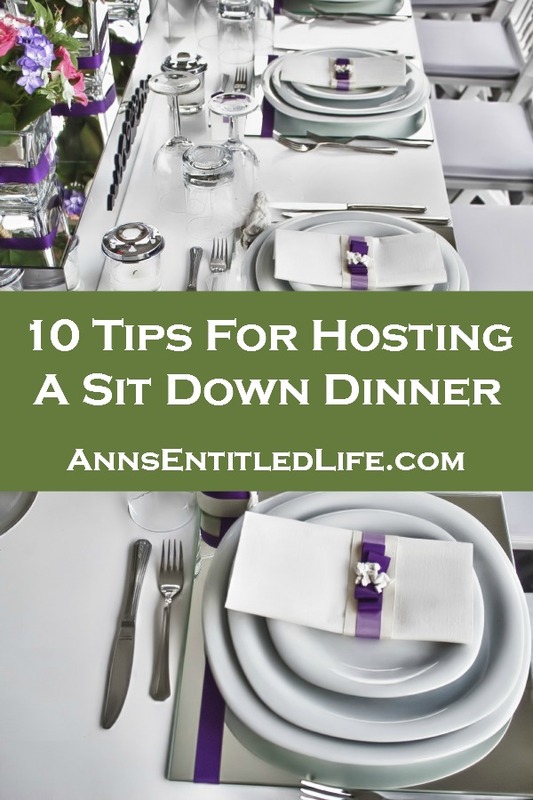 Here are 10 tips for hosting a sit down dinner that will help you with the big day’s time management. • Lists – who, what, when, where and how! Who is coming, what are you serving, when is the dinner, where is the dinner and how will it all come together!? Make a list for everything and cross the accomplishment off the list as you’ve completed the task. • Confirm how many people will be attending your sit down dinner. Once you have a definite number, you can make definite menu and table setting plans. • A week or two before the event, make a list of what you plan to serve. Check the larder to see which ingredients you have, and what you need to buy. Having all ingredients on hand prevents last minute trips to the store. And don’t forget the wine and liquor cabinet! • Do not be afraid to hire a caterer, order flowers from the florist or buy desserts from the bakery instead of doing it yourself. 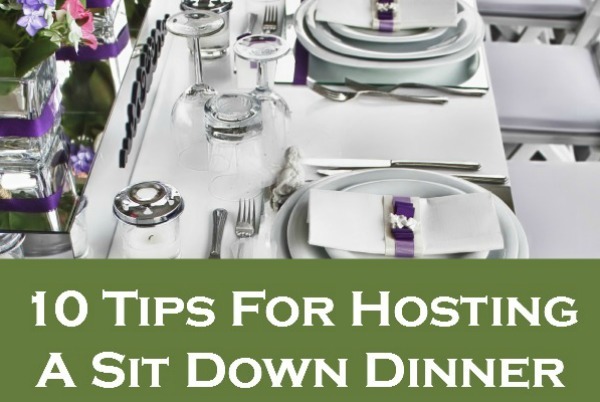 Delegating and hiring out help make hosting a sit down dinner a lot easier. • Where can you fit all the people you invited? If your dining room only has enough room for 10 people, and you have 20 guests coming, where can you set up a table and chairs for your dinner party? It may be the family room and that may require furniture rearrangements and extra folding tables being purchased or borrowed. And while you are at it, count the chairs! Do you have enough to seat everyone? If not, rent, borrow or buy some folding chairs. • Clean your house a few days before your dinner party, or better yet, have a cleaning service do it! • When choosing your desserts, make choices that can be made the day before if you haven’t ordered from the bakery. If you have bakery ordered, pick up (or send a the spouse) the morning of your dinner party. • Assemble your main dishes a day ahead of time (the day before when possible), and then refrigerate without cooking or baking. • Set your table the day before. Flip the glasses upside down to keep out dust. • The morning of the dinner, note all the times that your dinner items need to go into the oven, and set a timer to remind you when to start cooking! What tips do you have for hosting a sit down dinner? • For more Library Topics on Ann’s Entitled Life, click here. • For Cocktail recipes and wine recommendations on Ann’s Entitled Life, click here. Your comment about covering the glasses to keep the dust out reminded me of a tip to share. I wrap all of my serving dishes in plastic bags before storing them in my entertaining storage in the basement. This way, I don’t need to spend time re-cleaning the dishes when using them for the next party unless they’ve been stored away for too long. That is a fabulous tip, Barb!